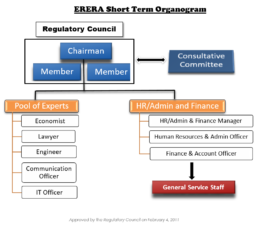 The Regulatory Council is the decision-making and managerial body of ERERA. The Regulatory Council is composed of three-member including the Chairperson. The Regulatory Council Members are appointed for a fixed, non-renewable term of five years. A new Chairman assumed office in April 2016, following the end of tenure of the first set of the Regulatory Council. He is Professeur Honoré Djamah Ségui BOGLER. In May 2017, Regulatory Council Members, Dr. Haliru DIKKO (Economist) and Mr. Aly Mar NDIAYE (Engineer) assumed duty. The Regulatory Council is supported by a pool of experts responsible for the regulatory matters and a unit responsible for Human Resources, Administration and Finances. This organizational arrangement, designed for the first three years of ERERA’s operations, will be progressively reinforced according to the evolution of the regional market and the development of activities. Consultative Committee of Regulators: This committee was established in December 2011. Consultative Committee of Operators: This committee was also established in December 2011. Directive on the Organization of the Regional Electricity Market in West Africa: Adopted in June 2013 by the ECOWAS Council of Ministers, the Directive’s main objective is to provide for the general principles governing the Regional Electricity Market within the framework of the ECOWAS Energy Protocol. Transmission Tariff Methodology for WAPP: The Transmission Tariff Methodology for the WAPP is to be used by the Regional System and Market Operator (SMO) to develop a clear, transparent and predictable model for the calculation of transmission prices. It defines steps to be followed and rules that govern transmission pricing among parties involved in cross-border power exchange transactions in the regional electricity market. The Transmission Tariff Methodology for WAPP was adopted by ERERA (Resolution N°006/ERERA/15 of 18th August 2015).